Rocket Lab, a privately-held company on Tuesday said its low-cost Electron launch system for small satellites will be the first rocket powered by batteries. Chief Executive Peter Beck said the company founded in 2008 to help commercialize the space business, expected to carry out the first flight of its all-composite Electron launch vehicle and the new Rutherford engine before the end of the year. 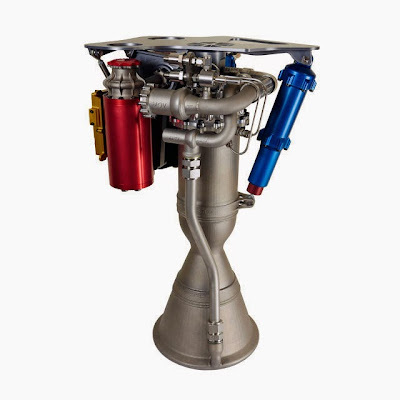 Beck said the engine was also the first to use 3D printing for all primary components, including its engine chamber, injector, pumps and main propellant valves, all mostly made of titanium and other alloys. The lightweight engine can be "printed" in three days, compared to about a month if it were built using traditional manufacturing. Rocket Lab, which is based in Los Angeles and has a launch site in New Zealand, says the two-stage Electron rocket will make it cheaper and quicker to launch small 100-kilogram payloads into low-earth orbit. The company expects to start launching satellites for customers in 2016, and eventually aims to launch a satellite a week. It says its launch cost will be less than $5 million, half the price that Virgin Galactic is charging for rides on its air-launched satellite booster, LauncherOne. The heart of a typical rocket motor are it's turbopumps. A turbopump is a very high-pressure propellant pump that spin up to 30,000 rpm to generate the pressure required for propellant combustion. The compression stage of a turbopump is typically driven by a gas turbine combustion stage. The Rocket Lab motor replaces the gas turbine with lithium polymer battery powered high-performance brushless DC electric motors to drive its liquid oxygen and kerosene, boosting efficiency from 50% for a typical gas generator cycle to 95%. Beck said the batteries on the new launcher would produce just shy of one megawatt of power, enough to power a whole city block. Each Rutherford engine has two electric motors the size of a soda can, Beck says, one for each propellant. The small motors generate 50 hp while spinning at 40,000 rpm, “not a trivial problem,” he says. Rocket Lab aims to help companies that want to launch hundreds and thousands of small satellites into low-earth orbit to provide space-based access to the Internet, respond to natural disasters and improve crop yields. Beck said the company had been working on the Rutherford engine for the past year and a half, racing to meet growing demand from companies ranging from Google Inc to small Silicon Valley startups. "There's a lot of payload ready to go," Beck said. "The missing piece is a responsive and cost-effective launch capability." The company's investors include Khosla Ventures, K1W1 and Bessemer Venture Partners.